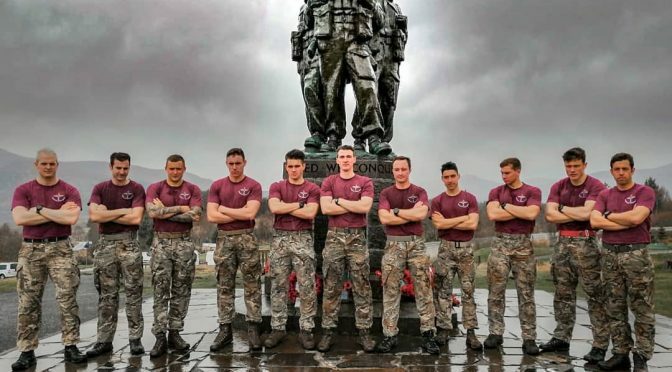 A team of serving Paratroopers from 2nd Battalion, The Parachute Regiment, have won the Commando Speed March 2019. This event is open only to serving soldiers and tests them over the course that prospective Commandos would have to complete. The origins of the Spean Bridge Commando Speed March can be dated back to 1940, then however, this test was the first hurdle for would-be volunteers for Commando Training at Achnacarry House (Castle Commando) having just transited by rail for fourteen hours. On arrival at Spean Bridge Station, the prospective Commandos would load kit bags onto a waiting truck and, under the lead of the staff, would then under take the 6.9 miles at the double, carrying battle order and rifle (weight 36lbs) to the grounds of Achnacarry House. During 1996, it was decided to reconstruct the original World War II Commando speed march to raise funds for the Commando Benevolent Fund and SUPPORT OUR PARAS as well as other charities. This has now become an established annual event attracting over 300 entrants a year.